Excerpt from Single White Female Backpacker part of the Teresa the Traveler series of books. I hadn’t planned to visit SeaWorld but so many people told me how much they loved it I figured it must be worth seeing. I am so glad I did. 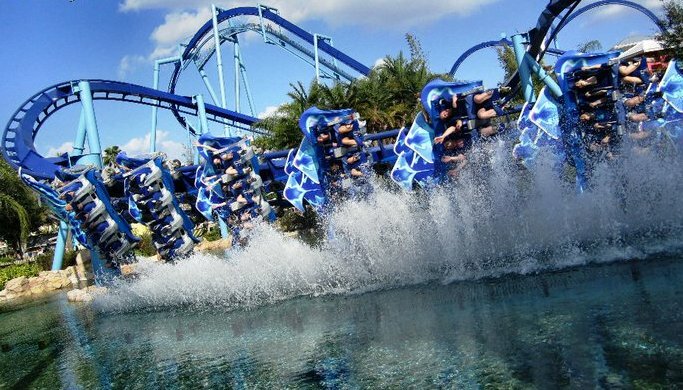 With a zoological and marine-life theme, the park is divided into four sections: Key West, Shamu’s Happy Hordor and The Waterfront. I got there just in time to catch the first Shamu show and that was how I started my day. Shamu was the fourth killer whale ever captured and the first to survive over 13 months in captivity. Most people know her as the star of the killer whale show at San Diego’s SeaWorld in the 1960’s. Captured by Ted Griffin in Puget Sound, Seattle in 1965, she was intended as a companion for Namu, a killer whale at Griffin’s public aquarium, hence the name Shamu (She-Namu). However, the two did not get along so Ted sold her to SeaWorld. Her career as a performing whale was cut short after an incident during a publicity event where she grabbed the leg of a SeaWorld employee who was riding her and refused to let go. She died in 1971, from an unspecified infection but her name continued to be used for the killer whale shows. 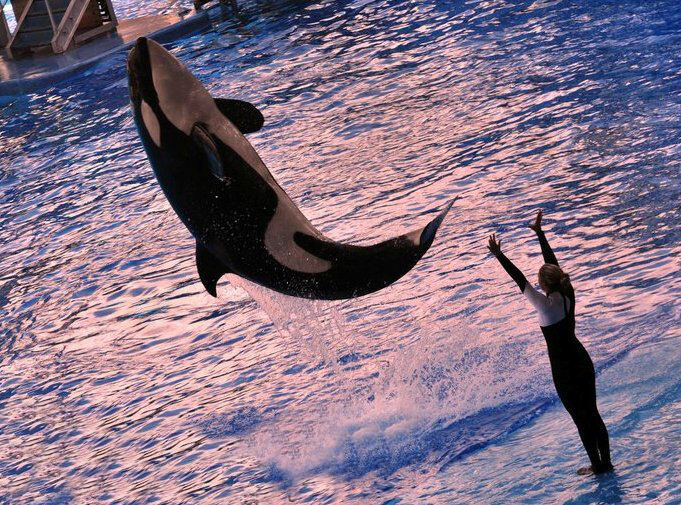 There is always a risk of injury and death when working with large animals in captivity and this was illustrated on February 24th 2010 when experienced 40-year-old trainer Dawn Brancheau’s arm was grabbed by a male killer whale during a “Dine with Shamu” show at Orlando’s SeaWord. The giant fish thrashed her about while swimming rapidly around the pool until she drowned. Fortunately while I was visiting, the whales were on their best behaviour and no one died during their performance. Too scared to ride Manta (the huge rollercoaster opened in 2009 that has people flying upside-down over a pond) I opted instead to check out Journey to Atlantis – the first rollercoaster – boat ride I have ever encountered. After hopping onto an eight passenger boat, we floated through Atlantis enjoying the underwater city until we were expelled and send up two different lifts before dropping down a steep canal. We then floated along the river until we reached another hill which we were pulled up. I though the ride ended at the top of the next hill but much to my surprise it brought us to a roller coaster which sped us to the exit. Having determined it was my favourite ride ever, I immediately went for a second turn. I spent the next few hours checking out all the animal exhibits including Penguin Encounter, Shark Encounter, Pacific Point Encounter, Dolphin Cove, Turtle Point, Manatee Rescue, Stingray Lagoon, Flamingo Lagoon and the Wild Arctic. Penguin Encounter is where they house their penguins and puffins in huge indoor habitats. The large glass window allows visitors to see the birds both on the land and swimming underwater. Shark Encounter features an underwater tunnel through which guests ride a people mover while observing a huge array of sharks, rays and venomous fish. Pacific Point Preserve is where the park houses their sea lion population while Dolphin Cove is where visitors can feed and touch the Bottlenose Dolphins. Rescued sea turtles live peacefully in Turtle Point which provides them with a shallow pool and beach for accommodations and rescued manatee’s, along with some alligators share accommodations at Manatee Rescue. Visitors can touch a stingray at Stingray Lagoon then watch pink Caribbean flamingos bathe in the Flamingo Pond. Those visiting Wild Arctic are treated to a motion-simulated helicopter journey to the arctic where they encounter polar bears, beluga whales and walruses. 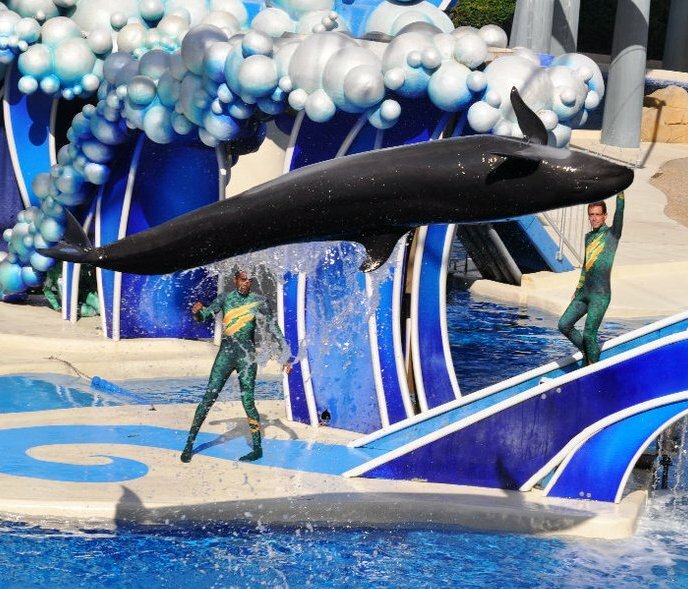 While I would have loved to watch all the shows at SeaWorld which include the killer whale show, dolphin show, sea lion show, waterskiing show, acrobatic show and various other animal acts, I didn’t have the time so I chose two. 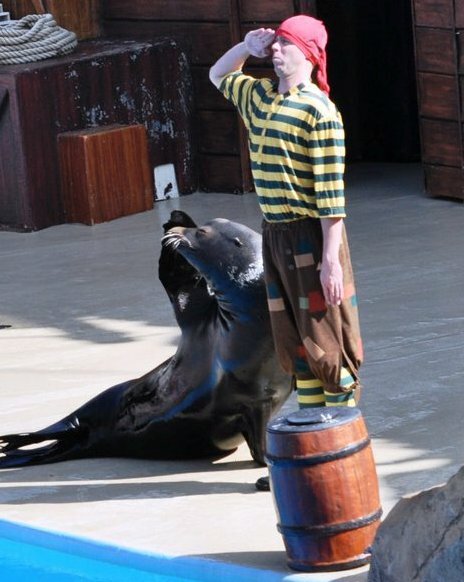 First I went to the Sea Lion show to watch Clyde and Seamore Take Pirate Island. Clyde and Seamore, a pair of California sea lions, entertained the crowd with such antics as ripping down a slide, imitating their human cast mates and waving to the crowd. These funny animal actors had me busting a gut giving me a whole new appreciation for sea lions. I ended my day at the dolphin show. I have seen a few dolphin shows in my time and they never cease to entertain me. 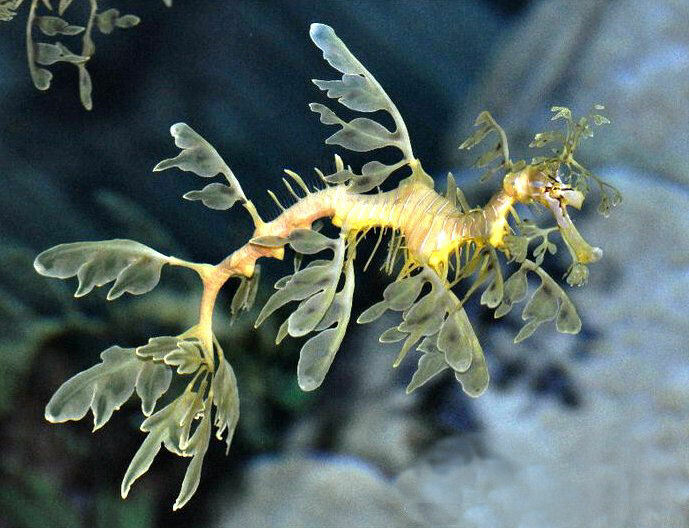 How the heck they got those amazing creatures to all jump out of the water in a line (I counted seven) at the same time is a mystery. If that wasn’t amazing enough, the grand finale also included a few of the dolphins doing somersaults in the air. By the end of the day I was wishing I had an extra day to spend at SeaWorld’s other park Discovery Cove where I could swim with dolphins and interact with an assortment of tropical birds, fish and other creatures.